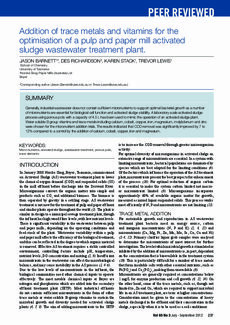 Generally, industrial wastewater does not contain sufficient micronutrients to support optimal bacterial growth as a number of micronutrients are essential for biological cell function and activated sludge stability. A laboratory scale activated sludge process using porous pots with a capacity of 4.5 L has been used to mimic the operation of an activated sludge plant. Water soluble B group vitamins and trace metals including calcium, cobalt, copper, iron, magnesium, molybdenum and zinc were chosen for the micronutrient addition trials. The results indicated that COD removal was significantly improved by 7 to 12% compared to a control by the addition of calcium, cobalt, copper, iron and magnesium.